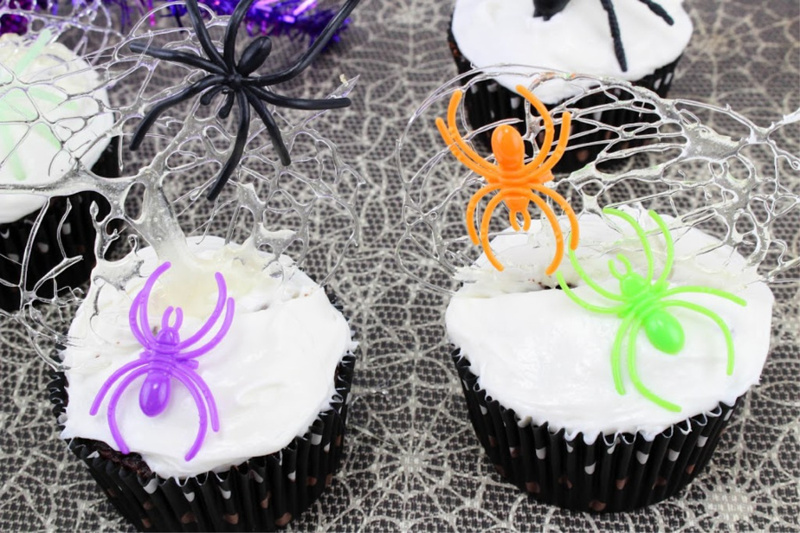 As much as I’d like to say these Spun Spiderweb Cupcakes will make a fun family time for baking together, it’s going to require more than one adult if you’re making these with younger children. Some of the ingredients must be watched, and you must work fast when making these are the candy will harden quickly. 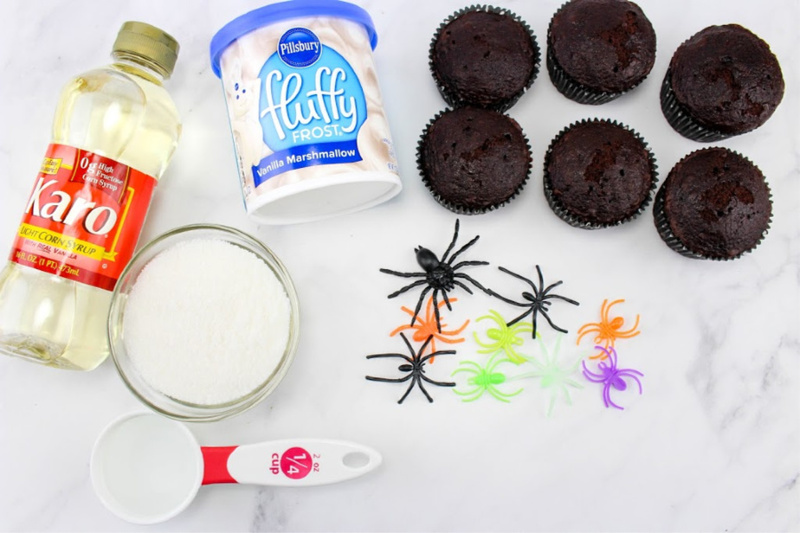 You can surely have the younger kids help with some of the areas in this recipe, but perhaps you can surprise your kids with these Spun Spiderweb Cupcakes as an afterschool surprise treat for Halloween. 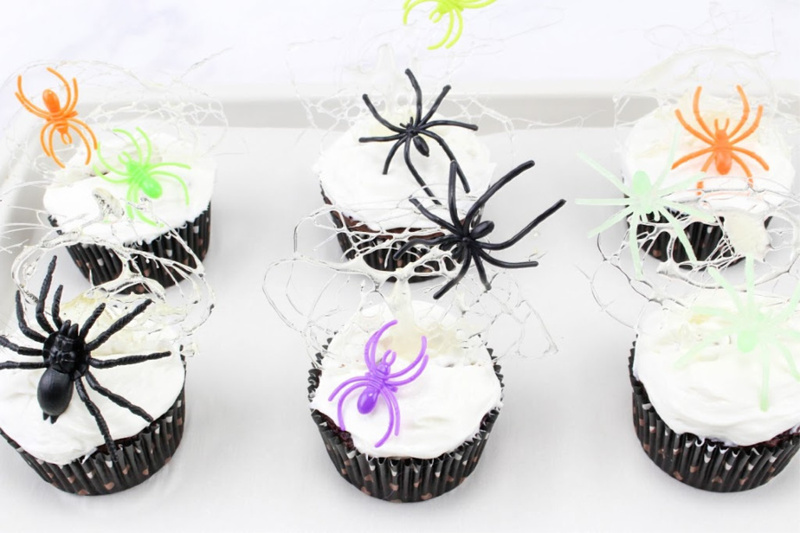 Whatever you decide, I know that you will surely enjoy the chocolate flavor and fun appearance of these spun spiderweb cupcakes. 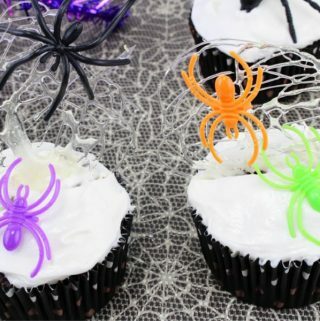 These cupcakes will really do well for any Halloween party this year, they may even be the talk of the party! 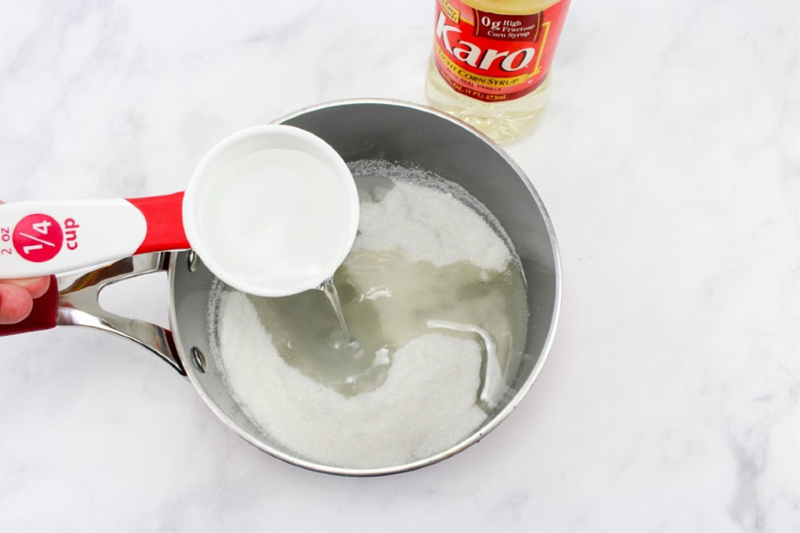 In a saucepan , add the sugar, corn syrup, and water, mix well. Place a candy thermometer on the side of the pan. Over medium to high heat, bring mixture to a boil. Make sure you are constantly stirring until you’ve reached a boil. Once the mixture is boiling, STOP stirring. 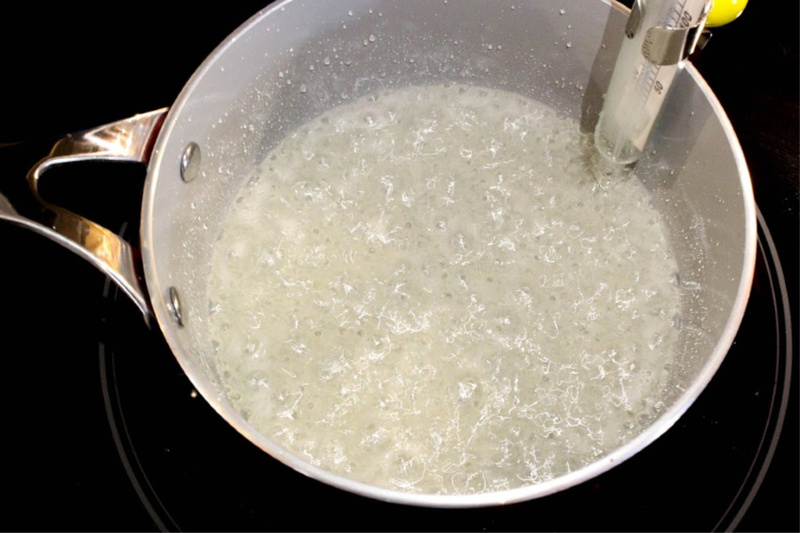 Let mixture boil for 6-7 minutes or until candy thermometer reaches 280 degrees. Take off the stove immediately and with a wire whisk create small round “webs” on parchment paper. I just spun the whisk in circles and crisscrossed back and forth a few times until I had a little web. ***You must work FAST. The candy will start to harden quickly. Make as many as you can before the mixture is gone or starts to harden. I managed to make about 12. I made extra just in case some broke. While those are cooling, frost your cupcakes. Once the webs are completely cooled, carefully stand them up on each cupcake. If needed, take a knife and make a score on the cupcake and place the web in the scored line. It’ll give the candy web a place to “sit” into. Place spiders all around on each cupcake. Just be really careful when placing them on the web. In a saucepan, add the sugar, corn syrup, and water, mix well. Place a candy thermometer on the side of the pan. 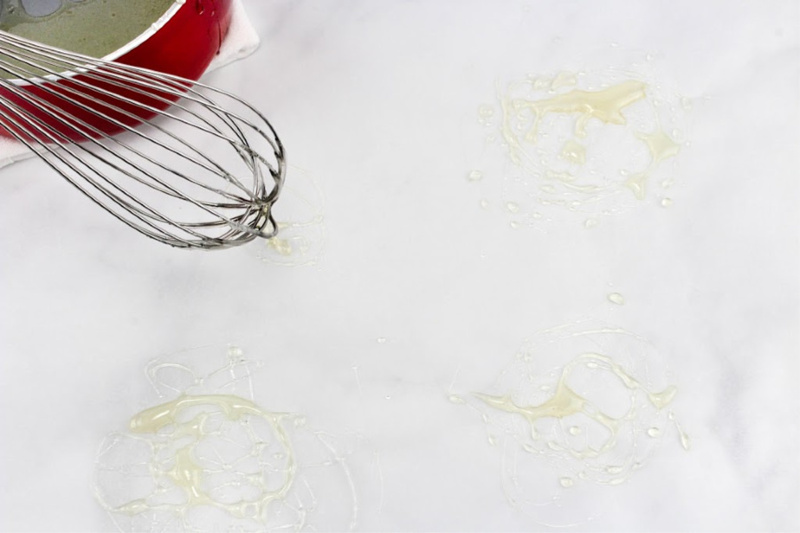 Take off stove immediately and with a wire whisk create small round “webs” on parchment paper. I just spun the whisk in circles and crisscrossed back and forth a few times until I had a little web. 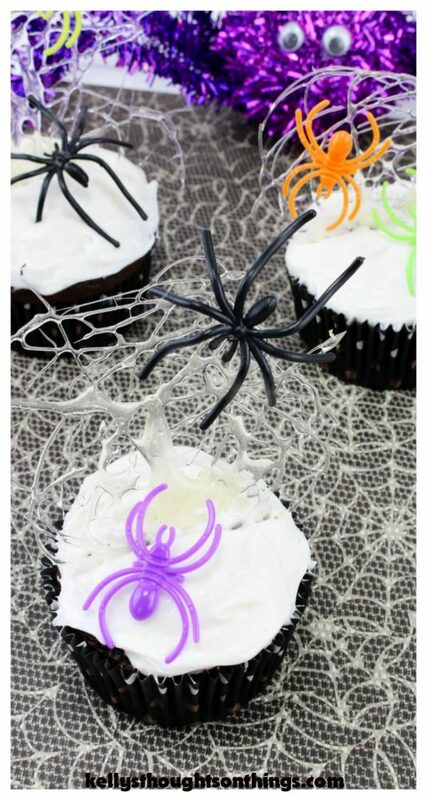 7.Once the webs are completely cooled, carefully stand them up on each cupcake. If needed, take a knife and make a score on the cupcake and place the web in the scored line. It’ll give the candy web a place to “sit” into.